As it is, beans are the only food on that list for which I eventually acquired a taste. 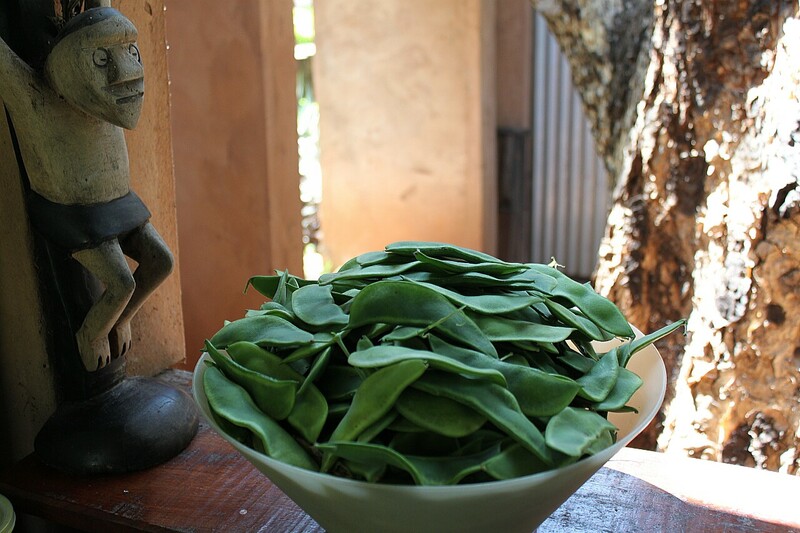 My love affair with beans began when I moved to the United States in 2002 and was introduced to the humble, nutritious black bean used in Latin American cuisine. So delicious were black beans they gave me courage to start exploring other varieties, other colors, other sizes … the biggest of which, and the most challenging of which, was the lima bean. Imagine my surprise, then, when I discovered the delicate-colored, melt-in-the-mouth, nutty-flavored beans were the antithesis of the tasteless, under-cooked teeth-breakers I remembered from school. It was a revelation! 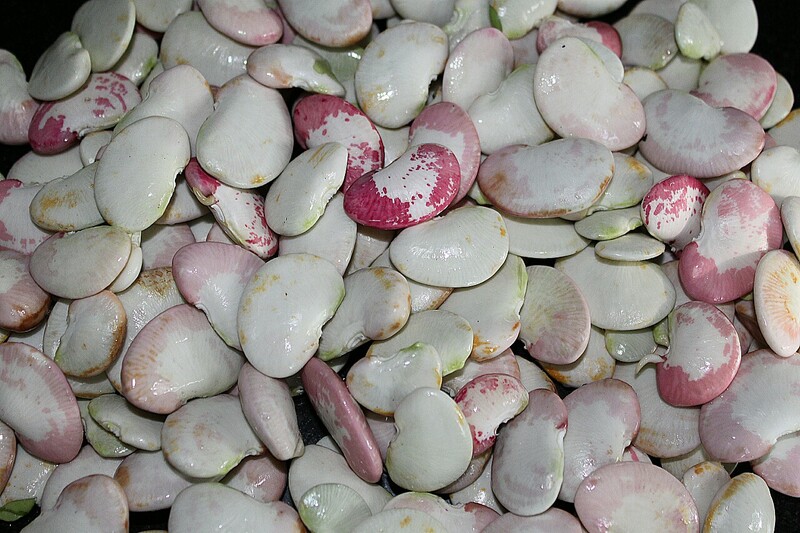 Christmas lima beans–in Italian Fagioli del Papa or “the Pope’s beans”–picked from the garden, ready to be shelled. Here we have three encampments of teepees covered in tangled Christmas lima bean vines. In our hot climate, the hardy pods come and go summer and winter, providing a year-round source of delicious nutrition. The vines die back from time to time but, like the pods, return with an ever-growing desire to increase their footprint by throwing out new tentacles. Chris and I eat the beans, raw or cooked, when they are young. We aren’t able to restrain ourselves long enough to dry them, which is how they are mostly produced and sold. When you cook them young they don’t need long in the pot, and if you’re using them in a salad, all that’s required is a quick blanch in salted water. We use them in soups, stews, side dishes and salads. My sister-in-law combines them with melted garlic butter for a starter or side dish. As you can see above, Christmas lima beans are a sight to behold. I sometimes feel it’s a shame to cook them! That said, one of the tastiest recipes I’ve found in recent months was shared by Martha Rose Shulman (martha-rose-shulman.com) in her July 2010 Recipes for Health column in the New York Times newspaper. I’ve reproduced it below with minor alterations, which proved to work just as well for us living with limited supplies, far away from a grocery store. These beautiful baked beans have a very sweet taste, though they contain only the natural sugars in the red pepper, tomatoes and beans themselves. Serve them on their own or with grains, as a main dish or a side. 1. Rinse the beans, and combine with the water, onion, half of the garlic, bay leaf and thyme in a large soup pot or Dutch oven. Bring to a gentle boil. Reduce the heat, cover and simmer for one hour. Add salt to taste, and continue to simmer gently for another 45 minutes to an hour until the beans are thoroughly tender but still intact. (*Young, fresh beans will fall apart if cooked for this long; I simmered mine for a total of one hour.) Remove from the heat. Remove the onion, bay leaf and thyme sprigs. Set a colander over a bowl, and drain the beans. 2. Preheat the oven to 350/180 degrees. Slice half the tomatoes, and set aside. Seed and chop the rest. Heat 1 tablespoon of the olive oil over medium heat in a large, heavy skillet, and add the red pepper. Cook, stirring often, until tender, five to eight minutes. Add the remaining garlic, and cook, stirring, until fragrant, 30 seconds to a minute. Add the chopped tomatoes, red pepper flakes, paprika and salt to taste. Cook, stirring often, until the tomatoes have cooked down somewhat, about 10 minutes. Add half the chopped mint or parsley, and stir in the beans and 1 1/2 cups of broth (reserve what remains in the bowl). Transfer to a baking dish, and arrange the sliced tomatoes on top. 3. Place in the oven, and bake one hour (*I baked the young beans for 45 minutes). Check from time to time to make sure the beans aren’t drying out. If they are, add about 1/2 cup of the reserved broth. Remove from the heat, and sprinkle the remaining parsley or mint over the top. Serve hot or warm. Advance preparation: You can make this dish in advance through step 1 or through step 2 and keep it in the refrigerator for up to five days. The finished dish will also keep for three or four days in the refrigerator. I had no idea my favourite beans were called Lima Beans. I have always known them as Seven Year Beans – one plant will go on producing for, well, seven years. They also make a delicious snack, boiled until soft and salted. Yum. Thank you for that. I’ve read that Christmas Lima Beans are also known as Seven-Year Beans, as well as Perennial Madagascar Lima Beans. They are native to Peru, hence Lima, but do well in all tropical climates. As a snack they sound delicious! Annabel, nice reading for me – sounds delicious! Made me smile with your mention of boarding school. What a difference when the blogger is someone I know. I’m too envious of your location! Excellent. Here in Hong Kong I am going to try this out with Mung Beans. That sounds delicious. I have some mung beans here in the deep freeze, so please let me know how they turn out. Thanks! I made this recipe with quite dry/mature dark maroon lima beans and it is absolutely delicious. It’s well worth doing if you’ve still got beans from last season stored in a jar – no need to wait for young beans to try it out! Thank you for this! So good to have advice about dry beans, too.